Made of solid metal, wrapped with a soft rubber comfort grip and offering 9 adjustable spray patterns this hose nozzle will quickly become your favorite yard tool. If you have any questions about the hose nozzle, let us know! Your satisfaction is always our top priority and we'll take care of you right away. The watertight construction can be used with all standard garden hoses, 5 extra rubber washers are included to further prevent leakage. Jet, Shower, Mist, Soaker, Fan, Cone, Centre, Flat, Angle. Use the 'Shower' setting for washing your dog and pets, 'Jet' to clean your yard or 'mist' for watering flower beds. HOSE NOZZLE - RELIABLE METAL - Made of premium solid aluminum, this lightweight nozzle is designed to last, finished in stunning silver chrome you'll love using this leak resistant garden hose nozzle sprayer. 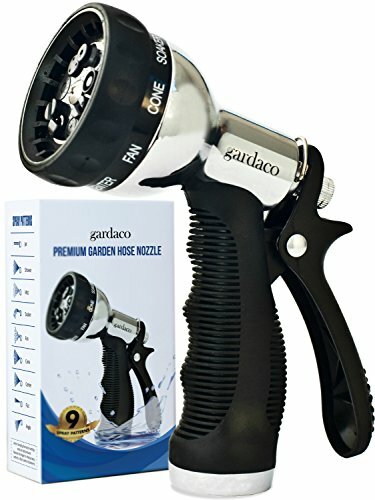 GARDEN HOSE NOZZLE - 9-WAY SPRAY PATTERNS - Each carefully selected pattern has a unique purpose, you will never need to use any other watering tool in your garden and home. To change patterns simply twist the nozzle. WATER HOSE NOZZLE - NO MORE ACHING HANDS - Provides effortless comfortable spraying. Your hand won't tire and you can water for long periods of time with the rear trigger, soft rubber grip and hands-free clip. FITS ALL STANDARD GARDEN HOSES - Connects easily to any standard garden hose, perfect for watering your garden, lawn, flower beds, washing the car, window cleaning or showering dogs and pets. CUSTOMERS ARE OUR #1 PRIORITY - If you haven't had a 5-star experience with us or your product, we want to do whatever we can to fix that! All of our products are tested and loved by us and our top priority is your 100% satisfaction. If you have any questions about this product by Gardaco, contact us by completing and submitting the form below. If you are looking for a specif part number, please include it with your message.